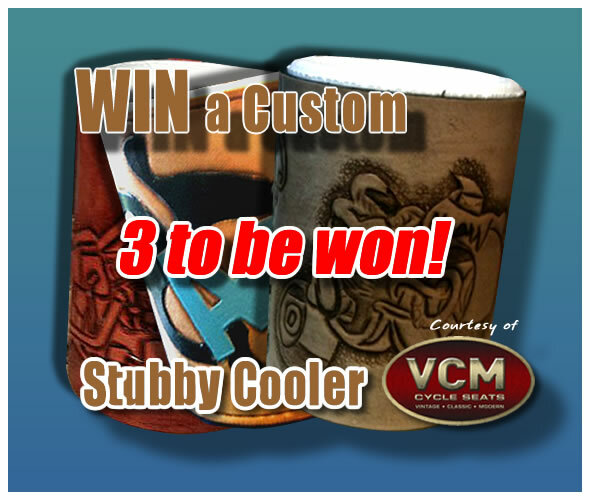 Here's your chance to win something completely unique - a custom made leather stubby cooler to cover that all important thinking/designing beer, from VCM Cycle Seats. (http://www.vcmcycleseats.com.au/). Kev has said that he will design it to your custom spcs, with a design of your choice. Uber cool! THERE ARE 3 UP FOR GRABS! Yep - 3 winners this month! THIS PRIZE WILL BE DRAWN ON 06/06/2012 (as it started late!) - So get your post in before then. As always I ask you to support our prize donators and check out VCM Cycle Seats and view their work. Kev has created some awesome seats for ASF member's bikes and comes highly recommended for anyone looking for a true top shelf job. Another great prize Kev. In.